2008 was a year full of excitement for Team 341. Team members put in a lot of hard work and in the end, Miss Daisy paid back in full. The team walked away from the Philadelphia regional with the Chairman’s Award in one hand, and the Regional Champion title in another. 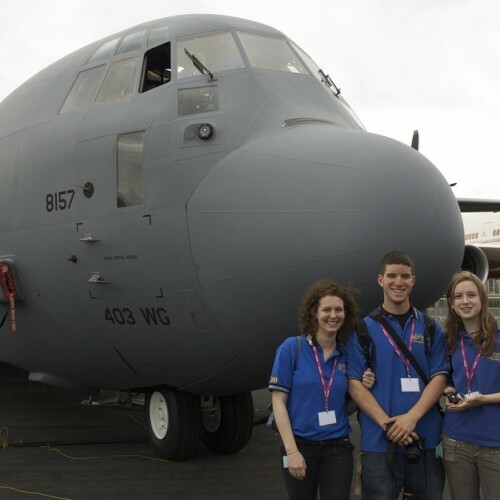 In the summer, the team was invited to England to demonstrate Miss Daisy at the Farnborough Air Show. The field for FIRST® OVERDRIVE™ consists of a circular ‘track’ created by dividing the field down the middle lengthwise with a tall metal separater. Across the middle of the narrow dimension of the field runs an overhead track where large balls called ‘trackballs’ sit at the beginning of each round. Two alliances, red and blue, composed of three teams each, compete in a 2 minute and 15 second long match. The object of each match is to score more points than your opponent by making counter-clockwise laps and manipulating the ball in different ways while making laps. A match is divided into two periods. The first, the ‘hybrid period,’ is 15 seconds long and is at the start of each match. During this period robots can be controlled by pre-programmed instructions and/or transmitted information via remote from a ‘robocoach,’ or human player. The second period, the ‘teleoperated period,’ is 2 minutes in length. During this period human drivers are in full control of their robots. 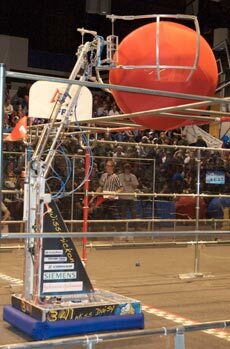 Alliance robots start catty-corner to each other on the field and must all be touching the wall of their respective end. Robots can only handle one trackball at a time and may not impede the flow of traffic on the track. Robots are also not allowed to aggressively go after their opponent’s bots and are especially restricted from preventing a robot from hurdling if that robot has already started the process of doing so.